You can bake a potato in the oven, crockpot, toaster oven and microwave. Learn how to get that crispy, flavorful skin and fluffy middle. If you ever wondered how to bake a potato, you’ve landed in the right spot. 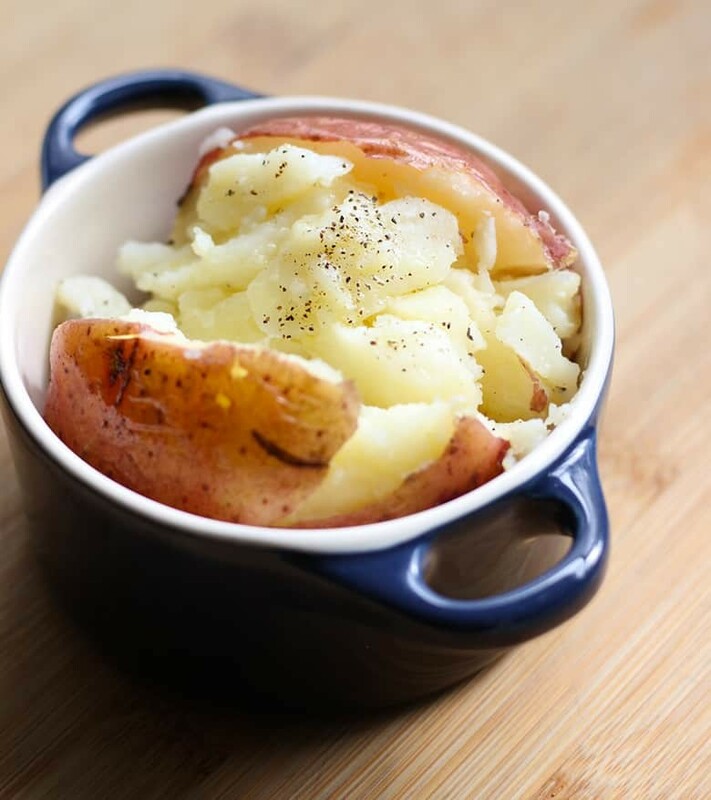 This can be personal preference but the general consensus is that the starchy potatoes like the Idaho and Russet are the best for baked potatoes. Their high starch content makes the inside more fluffy and has a softer bite. The carbohydrate molecules separate when heated and causes the insides to be lighter and fluffier. I have baked them all and I really enjoy the different characteristics of each potato variety. The lower starch potatoes like red, Maine and Yukon, are considered waxy potatoes and hold their shape better. When used as a baked potato, they have a firmer bite and mouth feel. These potatoes are best for fried recipes and potato salads. The don’t fall apart as easily as a Russet or Idaho. So in a nutshell, for baking, Idaho and Russets are generally preferred and for frying or potato salads, waxy potatoes are popular. That depends on what you need and how you like your baked potatoes. There are a bajillion ways to ‘bake’ a potato and there isn’t necessarily the ‘best’ or ‘perfect’ method for baking potatoes. Do you need it fast? – ‘Bake’ in the microwave. Do you love yours super moist? – Wrap in foil and bake. Do you want it done as soon as you walk in the door on a weeknight? – Wrap in foil and ‘bake’ in a crockpot on low. Do you like super flavorful skin? – Rub with oil, butter or bacon fat, sprinkle with salt and pepper then bake uncovered. Do you only have a toaster oven? – Prepare potato as usual and bake in your toaster oven. How to bake a potato in a microwave. Wash your potato very well and poke with a fork all over. Place in microwave and cook on high until fork tender, about 8-12 minutes. Remove, cut and top with your favorite toppings. 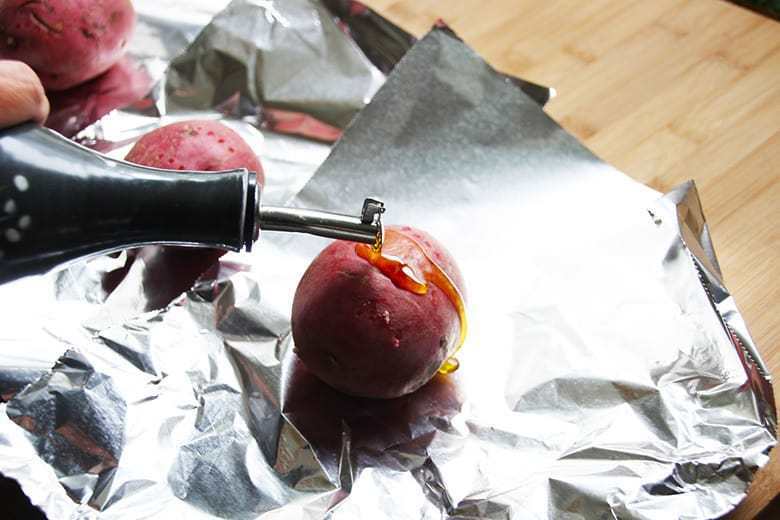 How to bake a potato in foil. Rub oil, butter or bacon fat on it, sprinkle with salt and wrap in foil. Bake until fork tender, about 45 minutes for medium sized potatoes and 50-55 for large potatoes. How to bake a potato in a crockpot. Place in crockpot and cook on low for 8-ish hours. How to get flavorful, crispy skin on a baked potato. Rub oil, butter or bacon fat on it. Sprinkle with salt. Place on a baking sheet and bake uncovered until fork tender, about 45 minutes for medium sized potatoes and 50-55 for large potatoes. How to bake a potato in a toaster oven. Preheat toaster oven to 400F. Bake directly on the toaster oven rack, uncovered for about 45 minutes for medium sized potatoes and 50-55 for large potatoes. Baked potatoes are blank canvasses. 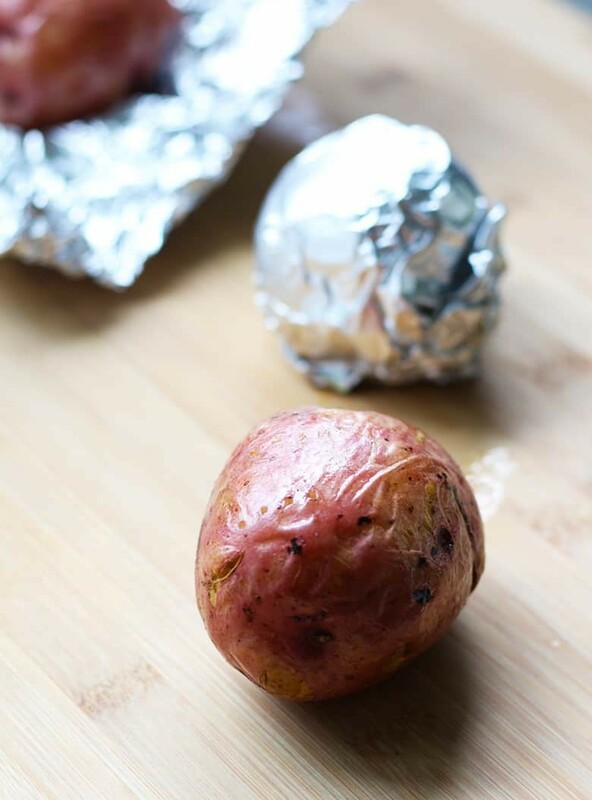 Whether you like your baked potato wrapped in foil or not, the toppings are where it’s really at. For my list of baked potato toppings, I went around the world and scoured my library of cookbooks for creative toppings. What is your favorite baked potato topping? Leave a comment. You can bake a potato in the oven, crockpot, toaster oven and microwave. Learn how to get that crispy, flavorful skin and fluffy middle. Remove from oven, slice open lengthwise, smush open by applying pressure to each end, top with your favorite toppings. 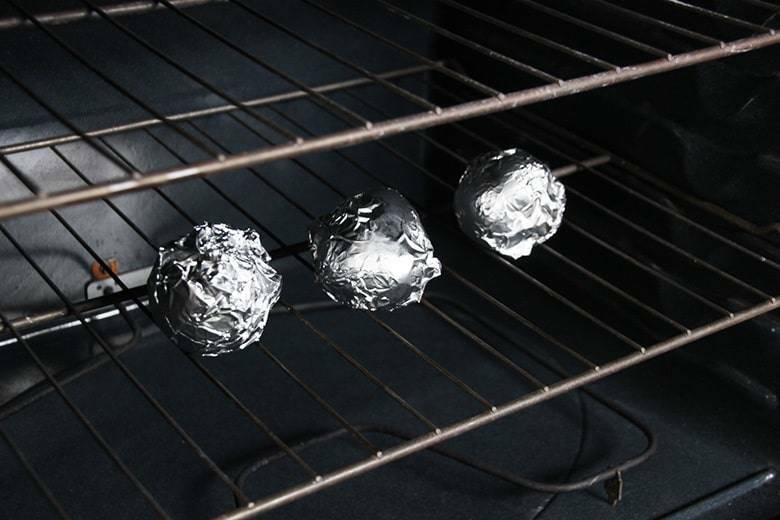 You can line your baking sheet with foil or parchment paper for easier clean-up. Top with your favorite toppings, see list above. I have kept fully cooked baked potatoes in the refrigerator for up to one week. Make a big batch and serve all week with different toppings for easy weeknight meals. This is super helpful. I didn’t know there were so many ways to bake a potato, seriously. Crockpot? That’s genius. I love the list of topping too, that’s perfect for anybody who lacks imagination like myself. Thanks for this, going to send this to my daughter. She loves potatoes and she will love all of these hacks. This makes so much sense to me. I have read so many articles on which is the best and there is so much conflicting opinions. Thanks so much for breaking this down, and I LOVE the topping choices. Super excited to start trying all of these.